Everyone loves a good balm right? I certainly do. They are brilliant for treating dry patches across the body, from lips to feet. 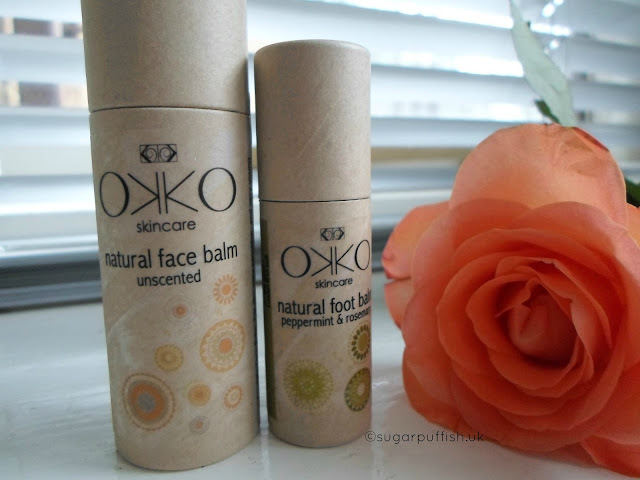 Let me introduce you to Okko Skincare. I've been testing their Unscented face balm and Peppermint & Rosemary Foot Balm. I like the combination of ingredients in the face balm. It’s a perfect blend of mango, apricot, avocado, sacha inchi and rosehip. This is also suitable for vegans, no beeswax instead they use candelilla wax. This is a nice soft balm which melts quickly on skin without feeling greasy or heavy. I love the eco friendly cardboard packaging it makes a change from glass jars which can be harder to travel with. The tube also makes it easy to dab the balm just where it’s needed. Perfect for those who don’t like sticking fingers in jars. You’ll have noticed that I'm championing the unscented products recently. I feel that many brands overlook the need to avoid essential oils. It’s not necessarily about allergies it also appeals to those who are pregnant or simply have an dislike to fragrance. Fear not if you do love your essential oils Okko have options for you as well. I will say that the foot balm isn't overpowering and the blend is very nice so I hope that’s an indication for the rest of the range. So to sum up I really like Okko balms and I feel like it has been a while since a brand has impressed me this much. I definitely recommend you go check them out and report back to me should you buy and try. I love their packaging. I think it's great when a brand goes beyond just the ingredients and makes the whole thing eco. I have one of the body balms to try, love a good balm me!